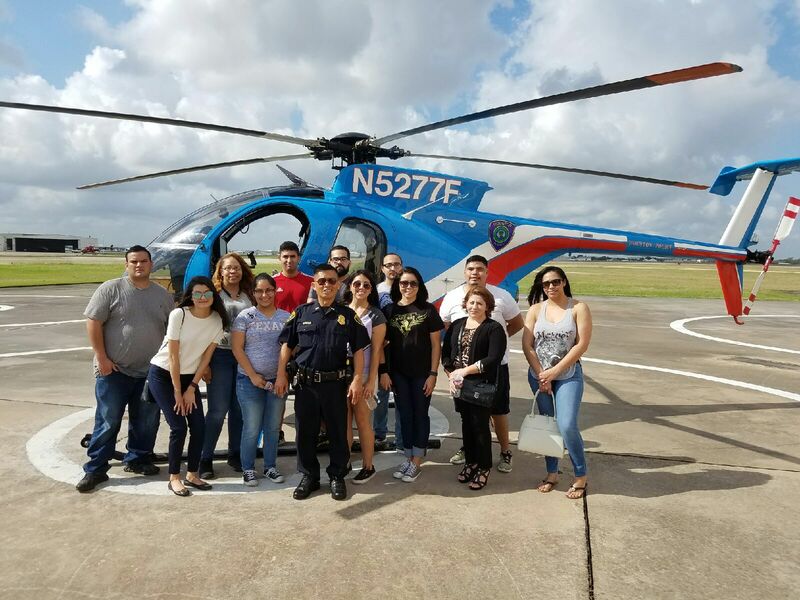 On Nov. 3, University of Houston-Downtown (UHD) students attended a tour at the Houston Police Department's Air Support Division. The Air Support Division consists of fleet of helicopters, which assist officers on the ground with vehicle/foot pursuit, tracking suspects. UHD adjunct professor Nhatthien "Nathan" Nguyen, who is also a Lieutenant with Houston Police Department (HPD), sponsored the tour as part of his CJ 4303 class, Vice Drugs and the Law. There were a total of 13 students participated in the tour. Air Support Division Officer C. Frank was extremely helpful in giving a brief history of the division, its training/safety protocol, operational procedures and personnel selection process. Some of the students were impressed with the safety record of the Air Support Division. Others commented that the tour re-affirm their plan to join HPD with its diverse career paths. "I enjoyed the tour and also learned so much," remarked a student participant. "It makes me appreciate the police department even more for all that they do. It also makes even more excited to be part of HPD in the near future."